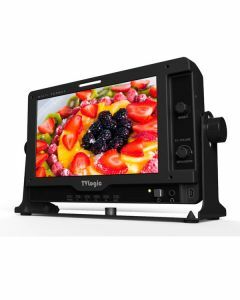 The latest small monitor from the TV Logic stable, the LVM-070C embodies most of the features of the LVM-074W with a new LED backlit LCD high resolution, high contrast panel with a 160 degree viewing angle. Supporting multiple signal format inputs the LVM-070C comes as standard with an input for HD/SD-SDI via BNC with a re-clocked output, HDMI input as well as analogue signal inputs via RCA connectors. The LVM-070C is calibrated to REC 709 as standard and also has a range of LUTs to convert the log outputs from a number of popular cameras to a more vibrant picture for use on set. Many features for control and display come as standard, including Timecode, Waveform and Vector, Range Error, Markers, user and fixed Aspect Ratios, Blue only/mono, and Focus Assist modes. De-embedded audio display with analogue output and has a manual UMD support. A desk stand is included in the package. Powered from DC, batteries (with various optional adapters) or from AC using the power supply included in the pack, the LVM-070C is ideal for compact Cine cameras, viewfinder or flyaway production uses. Options include a hard coated acrylic screen protection filter, carry case, rack mounts and battery adapters. Functions: 1:1 Pixel Mapping Modes for SD/HD, 3G-SDI Level A/B, Audio Level Meter Display, Blue Only, Focus Assist, H/V Delay, Luma(Y') Zone Check, Marker, Max Brightness On/Off, Mono, Range Error, Temperature Adaptive Color, Time Code Display, User Aspect, Various Scan Modes, Waveform/Vector, Zoom, Camera Lut.